Keep all your tools, yard equipment, decorations and sports equipment neatly organized in your garage with the help of storage cabinets and racks from Ace Hardware. With so many innovative designs available, it's easy to find the products you need to enhance garage storage and make yours a functional extension of your home. Do you consider yourself a weekend warrior? Transform your garage into a workshop specifically designed for you with the help of garage cabinets, workbenches, and tool chests from the top name brands you've come to rely on. With so many items available, it's easy to find a combination of storage cabinets that will fit your space and provide the storage you need for proper organization. Imagine walking out to your garage and being able to put your hands on the right tool for any job. Use the tool along the left side of the page to narrow your search by budget or brand for refined results. All those garden tools can junk up a garage quickly. Make everything look nice and tidy with proper storage cabinets and racks designed specifically with those items in mind. Line them up along the wall of your garage and you'll still be able to pull your car in with ease. Proper storage can even extend the life of your garden tools. Do you crave additional storage space in your garage but don't have the room. Elevate the garage storage in your home with ceiling-mounted storage racks. They are easy to install to your ceiling joists and provide great storage for those occasionally used items such as holiday decorations. Install just one or line them up across the width of your garage to maximize your garage storage space. Active families know that bikes, wagons, skateboards, balls, and surfing gear can quickly overtake a garage. Keep all those sports must-haves off the ground and within easy reach by installing bike hooks and storage cabinets around the perimeter. 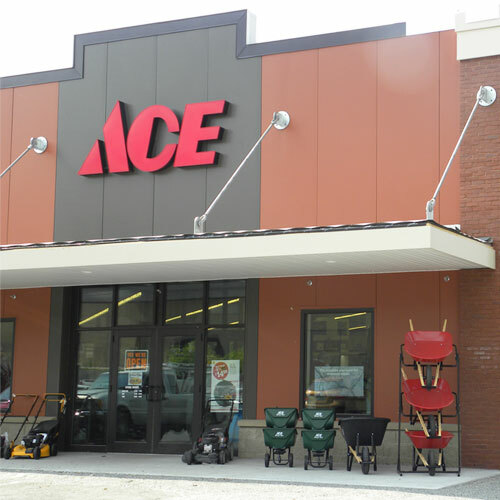 Make Ace, the helpful place, your one-stop shop for all the garage cabinets and racks you need. At prices like these, it's easy to design a space that provides the function you need while staying within your project budget. Mix and match your favorite pieces or collect multiple from a single collection for a cohesive look.